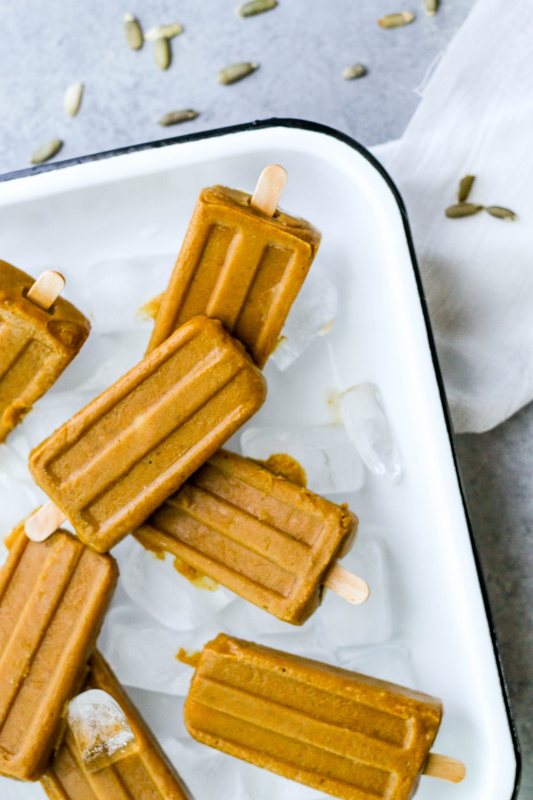 Vegan pumpkin popsicles that are easy as can be to make, the hardest part is waiting for them to freeze. For this recipe, I had the opportunity to work with non-dairy and vegan Bolthouse Farms Plant Protein Milk. It's made with pea protein which makes it a great alternative to traditional dairy and plant milk alike. So...Fall is here (amen! ); days are still on the warm side followed now by crisp cool nights. What does Fall mean to you? To me, it means cloud-covered skies, rainy days, amber colored leaves, and pumpkins galore. That being said (and as you may have guessed from the above title) I decided to make vegan pumpkin popsicles with Bolthouse Farms Plant Protein Milk (unsweetened) because it's texture is on point for making some frozen pumpkin creamy goodness, and it is made with plant protein, so you end up with a more nutrient dense vegan dessert. Ever since I started graduate school working towards a Masters of Science in Human Nutrition and Functional Medicine, I have paid more attention to the nutrient density of the products I purchase and the recipes I create. I love that this pea protein plant milk is packed with 10g of protein per 8-ounce serving and has 50% more calcium than dairy milk. Also, for this recipe I sweetened the vegan pumpkin popsicles with maple syrup which you could use more or less of to increase or decrease sweetness and added sugar content. Add all ingredients into a food processor or blender, adding the spices last. Blend on medium-high until nice and creamy. Pour mixture into a popsicle tray, place popsicle sticks, and freeze for 2 - 4 hours (until frozen). *This is a sponsored post for Bolthouse Farms. All information and opinions shared are my own. If you’re loving this vegan popsicle recipe let us know by commenting below. Also, remember to share with us on social by tagging @Raepublic and #Raepublic!